For a Limited Time receive Mike Phillips’ How To Detail Boats With Marine 31 Paperback Book FREE with your purchase! Retail Value $19.99. The Marine 31 Stainless Steel Polish & Sealant Combo is a money-saving combo that includes essential products for polishing and protecting stainless steel, chrome, diamond plate and uncoated aluminum. Marine 31 metal care products were developed to restore the shine and luster to metal surfaces without hard rubbing and buffing. If you’re seeking a brilliant, mirror-finish on your boat’s metal rails and fixtures, the Marine 31 Stainless Steel Polish & Sealant Combo is for you! 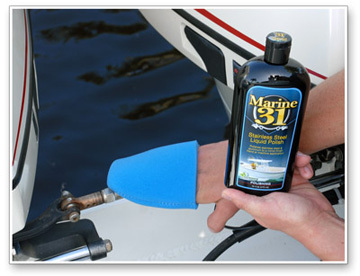 The secret to Marine 31 Stainless Steel Liquid Polish lies in its abrasive technology. The advanced abrasive in Marine 31 Stainless Steel Liquid Polish removes oxidation and staining without dulling the finish. While it’s technically considered a medium-cut metal polish, Marine 31 Stainless Steel Liquid Polish finishes more like an ultra fine metal polish, eliminating the need to follow up with a second step. Adding a coat or two of Marine 31 Stainless Steel Liquid Sealant locks in the shine and protects the finish for months, not weeks. Marine 31 Stainless Steel Liquid Polish is the perfect solution to dull, oxidized, tarnished metal surfaces on your boat. This medium-cut polish is designed to restore the shine and luster to uncoated aluminum, stainless steel and chrome with very little effort. Marine 31 Stainless Steel Liquid Polish creates a highly reflective finish that can be seen from a distance. Marine 31 Stainless Steel Liquid Polish is arguably the best boat metal polish available! Marine 31 Stainless Steel Liquid Sealant is a durable, acrylic based boat metal sealant that seals and protects stainless steel, aluminum and chrome surfaces. 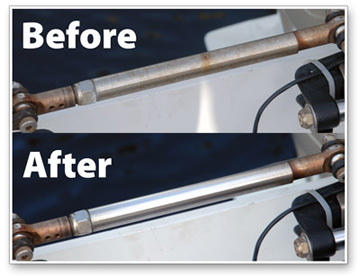 Treated surfaces will be well-protected against UV rays, salt degradation, bird droppings and other common contaminants that plague a boat’s metal surfaces from every day use. Designed to be applied to surfaces that are free of oxidation and rust, Marine 31 Stainless Steel Liquid Sealant creates a highly reflective, protective coating that lasts up to 6 months! The foam wax applicators can apply any wax evenly sealants without scratching the surface. They are absorbent in order to catch drips or runs, and they apply perfect, even coats of polishes and sealants.